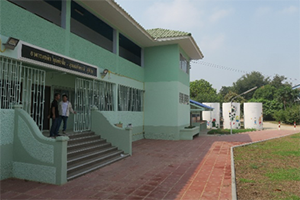 The Bangsadej Boys’ Building for 56 children reopened on 18 February 2017 after a complete renovation. The building had become dilapidated over the course of years. The sanitary facilities were defective. It rained through the roof and the equipment was heavily damaged. The house was completely renovated down to the walls and the roof top. Multiple roof slabs were replaced. 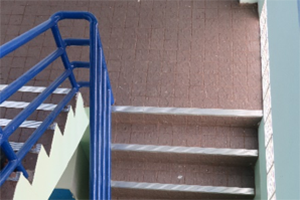 The building was painted using Pro Colour products and an additional seal was added to the walls up to 1.3m high allowing the use of high-power cleaning devices. At the entrance, a brick path was added. A reinforced slab of concrete was poured down under the brick slates in order to avoid damages due flooding. The rest of the outdoor area was turned into a grassy space. In the back of the building, the window bars received a fresh coat of paint. 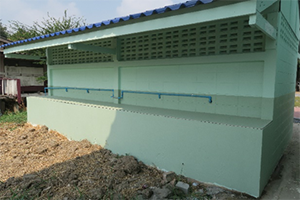 Due to the typical Thai construction with thin outer walls, the sewage pipes were laid outside the building. This also simplifies future maintenance. In the side building, the walls were again sealed up to 1.3m high. Unused materials were then also stored inside. 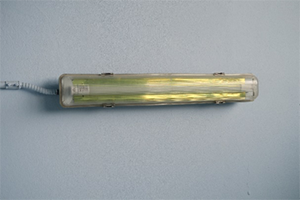 Due to the use of showers, the freshwater supply had to be completely redesigned. 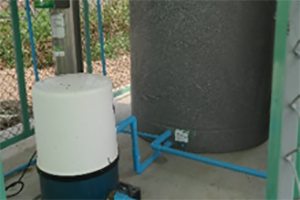 Spring water is pumped through a filtration system and passed into coated water containers. 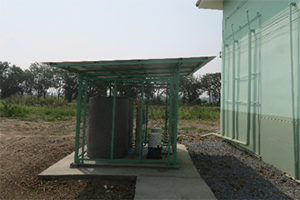 There are two containers that hold a total of 3,000 liters of fresh water that is used for the showers and toilets. 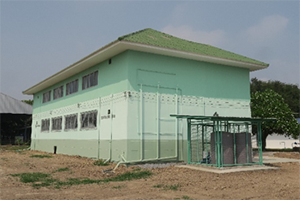 A water pump was installed for each floor in order to ensure that there is a water pressure of at least 5 bar. The pump house was fenced in to avoid theft and vandalism. All of the lights in and outside the building were switched over to LED technology which means that we save 80% of the power. The entire bathroom facility is made of stainless steel that comes from the company Debiel in France. 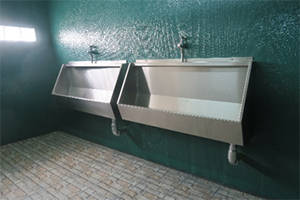 This company specializes in the production of sanitary facilities for prisons and public restrooms. The equipment is therefore very durable and can hardly be destroyed and lasts for many years, even with less intensive cleaning. 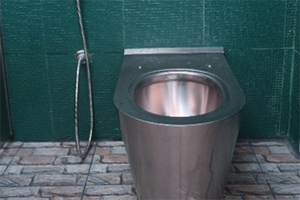 The urinals were also made of stainless steel and are equipped with water saving pressure switches. 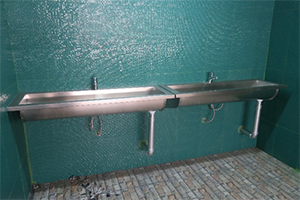 The sinks were made out of stainless steel with 30-second water saving fittings. 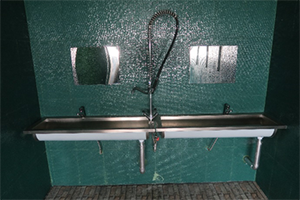 The sinks in the shower area were also made out of stainless steel and are equipped with a showerhead for washing shoes and clothes. There are also unbreakable stainless steel mirrors. 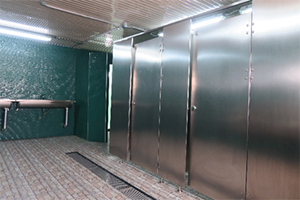 The stall walls were made of stainless steel with integrated locks hat secure them against vandalism. The staircase is made with natural stones and aluminum rails. 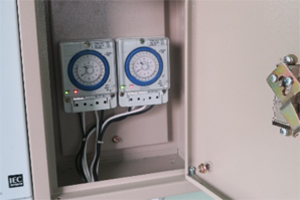 All of the lamps and sockets in the bedroom are on a timer in order that bed times are enforced and at night, no videos can be viewed on laptops or mobile devices. 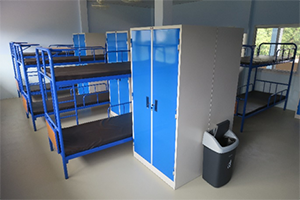 28 double beds and 56 lockers are found in the living areas. The beds are equipped with fold-out tables to allow for a space to complete schoolwork. The rooms are painted with Pro Color products and sealed up to a height of 1.3m to allow for easy cleaning. The floor is made of non-slip Epoxy. It is a product from the company MA-Experience and is loadable up to 40t. 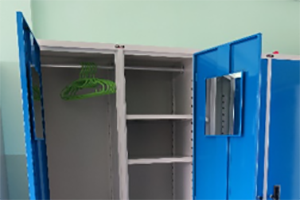 The lockers have shelves, mirrors, and hangers. Every child has a whole locker. 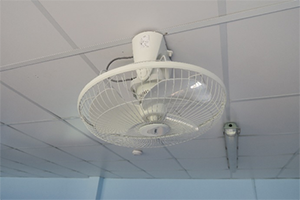 Ceiling fans are placed above each double bed. They are each individually controlled. 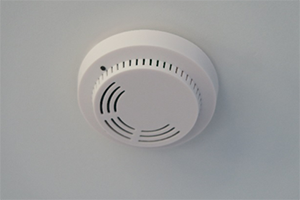 An intelligent alarm system with fire detectors was installed. In case of a fire, the alarm sends a text to the fire brigade and the home. 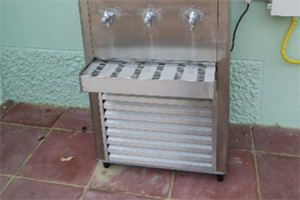 A water fountain with a cooling device was installed. The water fountain is connected to the school’s central clean water supply. 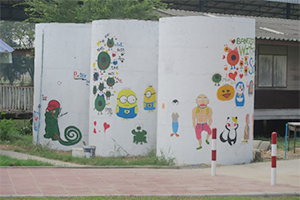 The old water tanks could not be demolished, and thus the concrete pillars were turned into a work of art by the children.